Tang period (618-907), Chinese workmanship. A quatrefoil gold box with lobed and barbed sides. The slightly domed cover is worked in repoussé and decorated with a fanciful lion seated amidst flowers enclosed in a barbed, beaded border. An outer border of floral swags is enclosed within a border of leaves surrounded by a band of ring punched decoration between raised edges. The sides of the box are engraved with two continuous flowering bands on a ring punched ground. The underside and interior are left plain. The box is precisely designed so that the top and bottom fit snugly together. Lions are not native to China and were not seen on Chinese artifacts until the Tang period when they were first used as symbols of power and authority. Soon a less ferocious and more playful lion motif was introduced like the one on this box which is surrounded by a delicate floral arrangement. A small box such as this would have been for personal use and may have been intended to be given as a gift. The Tang period was one of reunification, peace and prosperity, and artistic growth following a time of great political unrest. In 674 the last Persian dynasty had been defeated by the Arabs and sought refuge within the Tang court. As a result, trade routes across Central Asia opened and Persian metallurgy styles and artistic techniques began to influence Chinese craftsmen. This, combined with the development of gold mines in China fostered the “Golden Age” of Chinese metalwork. The artistic beauty and unrivaled quality of work produced at this time reflects the affluence and sophistication of the Tang Court. In our opinion, this box is an excellent example of the period in terms of form, material, decorative motifs, and workmanship. 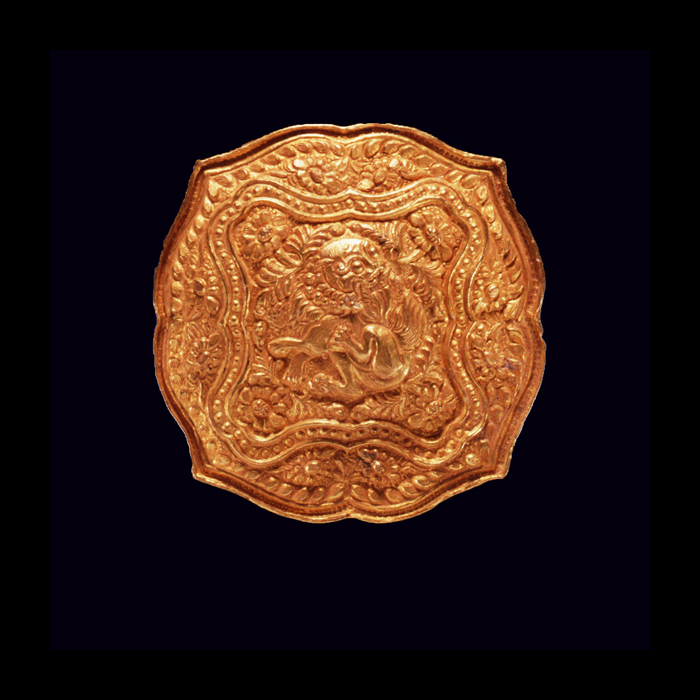 A similar lion motif adorns a dish of similar date illustrated in Arts and Crafts Volume 10- Gold, Silver, Glass and Enamel, Chinese Art Series. People’s Republic of China: Wenwu Publishing Co., 1987. Page 29. 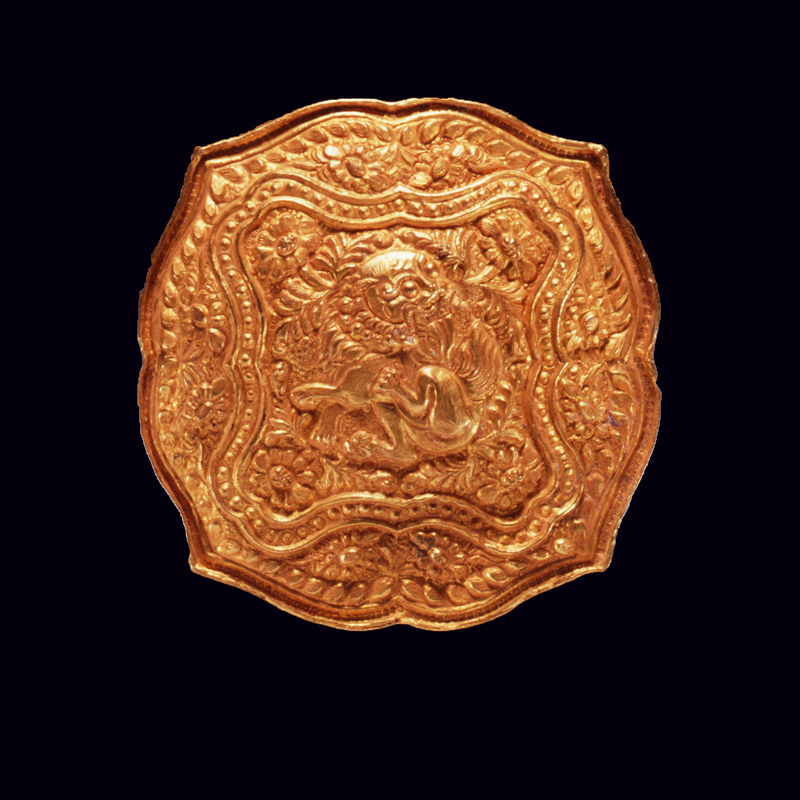 A gold polylobed box dated Song period is illustrated in Imperial Gold from Ancient China, Part II. London: Christian Deydier Oriental Bronzes, Ltd., 1991. Page 26, plate 8. Also see pages 10-13 for a discussion of Tang metal work. The occurrence of the lion in Chinese art is discussed in Chinese Ornament: The Lotus and the Dragon. Jessica Rawson. London: British Museum Publications, Ltd., 1984. Pages 110-114. See a similar pair of Liao period repoussé gold boxes illustrated in Chinese Art From Distant Centuries. S. Bernstein & Co. Dharma Enterprises. 1993. Plate 17. For a history of the Tang period see “Sui and T’ang.” A Short History of Chinese Art. Michael Sullivan. University of California, 1967. Pages 145-168.